Caryn Hartglass: Hello, I am Caryn Hartglass and you are listening to It’s All About Food. Our next guest is Bryanna Clark Grogan. She’s is the author of eight vegan cookbooks with over 22 years experiences. Among her previous titles are Nona’s Italian Kitchen, Authentic Chinese Cuisine for the Contemporary Kitchen, The Almost No Fat Cookbook,, and The Fiber for Life Cookbook. She also developed the recipes for Dr. Neil Barnard program for reversing diabetes. A teacher, a lecturer, and a former newspaper columnist, you can see Bryanna’s blog at VeganFeastKitchen.blogspot.com and her website at BryannaClarkGrogan.com. Woo, I am talking to Bryanna Clark Grogan! Bryanna Clark Grogan: Good morning! Caryn Hartglass: Good morning, I am excited! I have been looking at your recipes for a very long time. Bryanna Clark Grogan: That’s good. So, you have a little idea about what I do. Caryn Hartglass: Oh gosh, yes! In fact, one of my favorites is from the Nona’s Italian Kitchen, the biscotti. That is such an easy and fabulous recipe. Caryn Hartglass: Right. You mentioned it a few time in the World Vegan Feast Cookbook that we are going to talk about today. You mentioned this thing about some baked goods or sweet goods being too sweet and I totally agree with you. Bryanna Clark Grogan: Well, you have a bit of an overload at the holidays. Caryn Hartglass: Yeah, especially we are frequently invited to a vegan cookie party and, oh God, total sugar overload. It is just painful. But, I don’t like very sweet desserts and it is one of the great reasons why we should all be getting in our kitchens and making stuff the way we make it. Bryanna Clark Grogan: That’s right. That’s for sure. Caryn Hartglass: One of the things I like about the end of the year holidays more than the rest of the year is I think people get into the kitchen a little more or they find their kitchens. Bryanna Clark Grogan: I hope so. Caryn Hartglass: So, talking more about some of the cookbooks that have recently come out, specifically for this holiday period. It’s funny when I look at your name and I see all this information that is on your website and in your books, I think of the Encyclopedia Britannica, for me, it was the premier of all kinds of information, encyclopedia information, and I think that if there was ever going to be an encyclopedia of vegan food, it would be the Encyclopedia Bryanna, something like that. Bryanna Clark Grogan: My husband calls me an information junkie and I do also run a branch of a library, a small library, so I guess I can’t help myself. Caryn Hartglass: Right. That’s a good thing. You say this book is really for everyone and it is for anyone who wants to dig into it. But, it’s for people who really want the detail because you go into it. Bryanna Clark Grogan: I figure if you put the detail there for people that wanted to know, it is there. If they don’t care, they don’t have to read it. My first editor, I worked on many, many years ago on La Leche League Cookbook and she told me to write the recipes and you should remember that most of the people or some of the people won’t know nothing so you have to write for those people. Then, the people who are more experienced will just gloss over the details. I think that was really good advice and I will always remember that. Caryn Hartglass: Great. Yeah, I agree. You know, I read this thing once about cookbooks which I think is unfortunate that people that get them maybe try one or two recipes in them. I keep saying, read it from cover to cover, read the entire book like a book and then use it. Bryanna Clark Grogan: Exactly. I am just going to give a recent example and I won’t mention the name of it. There was one new cookbook that came out and I went through it and it was okay, I thought, but nothing really jumped out at me. But, then I had to do a review of it and when I actually dug into it, I was just floored by the writing style and the ingenuity. You know, a quick glance doesn’t just do it justice. Caryn Hartglass: That’s the thing about cookbooks, certainly if you have a big budget behind you, you can make if really a work of art in terms of photographs and color but does not guarantee that it is a good cookbook. Bryanna Clark Grogan: Oh, that is for sure. I have hundreds of cookbooks probably, over 500, and many, most of the ones I use don’t even have photographs in them. Caryn Hartglass: Okay, so let’s get to the meat of this. Bryanna Clark Grogan: Meat is not a bad word. You have nutmeat, and grain meat and all kinds of meat. Caryn Hartglass: Actually, I may use that, ‘Meat is not a bad word.’You go into the first bunch of recipes are the essentials where you talk about a number of soy foods, tofu, seitan which is a wheat gluten product and how you make them. You talk about people who are into cooking and would gloss over this. I read it and I thought, “Oh, I didn’t think of that.” Sometimes even people that are experienced in cooking when they read someone else’s perspective are going to pick up on something. So, I say read. Bryanna Clark Grogan: Oh, definitely. Caryn Hartglass: We were talking about World Vegan Feast now. 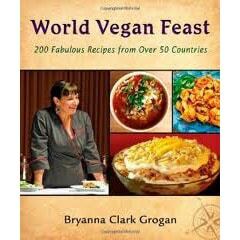 Bryanna Clark Grogan: I am talking about World Vegan Feast. Caryn Hartglass: Yes, you are the author of eight cookbooks and now we are talking about your most recent one, World Vegan Feast. Bryanna Clark Grogan: Well, I am still learning and I have been cooking since I have been a little girl and I just love to discover new things. You can never know everything. So, you are right. You really shouldn’t pay attention to some of the stuff in the introductions and the basic things in the cookbooks because you often get really good ideas and things that you didn’t know about and new ingredients and that sort of thing. I think it is important. Caryn Hartglass: New ingredients – and I wanted to talk about this – you mentioned this in your book that you didn’t think that you were much of a baker when you were young and you realized because your mom didn’t bake much and then you got into it and learned quite a bit. It is funny how we tend to stick with the foods that we grow up with unless we make a real conscious effort to learn more and go outside of that comfort box. Caryn Hartglass: Even as a vegan, I learned a lot but I still kind of stuck with the same vegetables and things that I grew up with and it has been a little bit of an effort to consciously buy some other stuff until it becomes routine. Bryanna Clark Grogan: Yes, some people complain that they don’t have much variety or they don’t like new things. I just say maybe try something new once a week and then you can just learn to like some new favorites because there is so much variety out there now, much more when I was growing up. Although I grew up in California with a little bit more variety then say, the Midwest at that time. Just try something new every week and you will never know. Caryn Hartglass: Go to the produce section and just pick out something that you haven’t used before. Learn how to use it. Bryanna Clark Grogan: Or greens. There is all these greens now that we never heard of twenty years ago. You may not like all of them but you may find some new favorites. Variety is nutritionally a good thing and it is also the ‘spice of life’ as they say. Caryn Hartglass: That’s right. How about – I was surprised to read a little section in the beginning of the book about textured vegetable protein and because you kind of dispelled some of the myths about it. Can you talk a little about that? Bryanna Clark Grogan: Yes, I think it has been around for a long time. There have been a lot of studies pm soy and it was really only one of the meat substitutes that we had back in the old days. Bryanna Clark Grogan: But I think that there have been some misconceptions that people equate it with hydrolyzed vegetable protein and that is not the same thing. That is something that is used in a small amount in processed foods but it is not the same thing as textured vegetable protein which is basically just soy flour that is cooked and extruded through certain sized dies to make different shapes and granules and then dried. Caryn Hartglass: I wonder how that was started because I had heard it and really haven’t used much since I heard that although I didn’t research it. It is good to know that it is really all it is, just soy flour textured protein because it is a great product that you can make. Bryanna Clark Grogan: I know, it is a great product to have in your cupboard in case of emergencies. All you have to do is add hot liquid to it and you can make the hamburger substitute or have the chunks or whatever. I don’t know exactly how that got started. I should add that I give resources in finding organic variety of textured vegetable protein so anybody who is worried about that, it is available. Caryn Hartglass: Well, that is important for soy foods because there are those nasty, genetically modified soy beans running around, taking over the world. Bryanna Clark Grogan: So yeah, it is getting easier and with the internet of course, you can get a lot of stuff on line and that textured vegetable protein – soy protein is the same thing – will keep for a long time if you keep it dry. So, you can get a bunch of it online and stash it in your cupboard. I like the chunks for stews and stir fries. Really, even when you are paying a little more for the organic it still is less expensive in buying the little packages of the meatless strips that they have now which are good but they do tend to be a little bit expensive. Caryn Hartglass: I don’t have much patience for that excuse that it is too expensive because in my opinion, what we put in our body should be top priority. Bryanna Clark Grogan: That is true but there are some people that are on strict budgets and they have to think about that. Caryn Hartglass: Especially now with the economy. Bryanna Clark Grogan: We have to think about that as well. You can eat really well on a pretty low budget. I think it is a matter of training some people who had not learned to cook. Learning to cook is the number one thing to saving money actually. Caryn Hartglass: Yes, find your kitchen! Bryanna Clark Grogan: Yes, exactly. Not just for health but for your budget, too. It is for fun, it doesn’t have to be a chore. Caryn Hartglass: I appreciate that you don’t have to eat soy on a vegan diet. Caryn Hartglass: Yes, I like it. Now this book, World Vegan Feast, is 200 fabulous recipes from over 50 countries. I am just curious; you live on a little island in British Columbia. Do you travel a lot? Bryanna Clark Grogan: Not really. Bryanna Clark Grogan: I live on a budget, as well. When I do travel, it is usually to the States to visit family or friends. But, I do have an international background. My father was Peruvian and part Italian and I am just interested in everything all over the world. I read constantly about different cuisines and try to be as authentic as I can, talk to people. I was lucky to have grown up in San Francisco and then later lived in Vancouver for many years and those are really cosmopolitan cities with many, many cultural diversities. Caryn Hartglass: I certainly would love to travel but the world is really at our fingertips now with the internet. I live in New York City in Queens and there are I think more languages spoken here than anywhere else. Bryanna Clark Grogan: Maybe Toronto. That’s pretty good. Caryn Hartglass: There are definitely neighborhoods that I go to where I feel like I am travelling internationally. Bryanna Clark Grogan: That’s pretty wonderful. The high school that I went to in San Francisco had every race and culture and religion that you could think of. It was just a real melting pot and I think that was a really good experience. Caryn Hartglass: Now, you started cooking before you were a vegan so you have some culinary training from the conventional world. Bryanna Clark Grogan: Self-taught actually. My mom says I was cooking before I can remember. She said I used to pull up a stool and try to help her. I tried to cook my first dinner she said at six or something like that. I can’t remember. Caryn Hartglass: I think some people come to cooking naturally and some people struggle with it and that’s why detailed cookbooks like this are good for those who are uncomfortable in the kitchen. Bryanna Clark Grogan: That’s right. Caryn Hartglass: But, we all shouldn’t be and we need to put it back in our DNA. Caryn Hartglass: Now, do they cook like you? Do you have vegetarians in the family? Bryanna Clark Grogan: Some. Not my son, but although he likes what I cook him. My children are all grown up, of course, and have their own families but my middle daughter is a vegan now and two of her daughters are vegetarians and my oldest granddaughter who is 19, she became a vegetarian when she was 14. Caryn Hartglass: It’s funny how it works for some, but it doesn’t work for everyone. Caryn Hartglass: I have heard that before, waking up and guess I am a vegetarian. Well, why not when you have all this great food around you? Bryanna Clark Grogan: That’s right. That is all that counts to him is that it tastes good. He felt better. He was eating a local egg now and then but he hasn’t even done that in quite a long time. Caryn Hartglass: Did you come to this for ethical reasons? Bryanna Clark Grogan: I guess you can say that. I actually was one of the homesteading young people in the 1970s and we had my first – my late husband and I had a homestead and raised our own animals and we moved to the island and we had a smaller place and I didn’t want to deal with that anymore. Then, my husband died. Caryn Hartglass: Do the dirty work. Bryanna Clark Grogan: …and so I decided the only thing to do was to become a vegetarian and a few months later I became a vegan because it was logical. Then, John Robbins book came out, Diet for a New America, I just read that all in one night. That just solidified my decision. That’s when I started writing cookbooks. There weren’t that many good ones out. Caryn Hartglass: We needed them. Absolutely. It is really fascinating how the cuisine has developed over the last twenty-five, thirty years. Bryanna Clark Grogan: Just this last year, how many vegan cookbooks have come out? Caryn Hartglass: I was just going to ask you how you felt about that. Bryanna Clark Grogan: Oh, I think it’s wonderful. Caryn Hartglass: Yeah, there are so many. Bryanna Clark Grogan: Absolutely. I am in my 60s now and I am just so happy that there is a whole new generation of cookbook writers out there because I’ll probably want to retire and I might have a book or two left. There is just so much out there. I think it is wonderful and whenever I go to a conference or something, I think it is really great that all these cookbook authors to get together. You know, it is not competitive; we are supporting each other’s books and it is trying to get the word out there and it is really a great atmosphere, I find. Caryn Hartglass: I really look forward to the day that saying ‘vegan cookbook’ is sort of redundant. Bryanna Clark Grogan: Exactly. You know, most people have non vegan cookbooks, so why not a whole bunch of vegan cookbooks? Caryn Hartglass: Absolutely. We know that the most popular books that are sold are cookbooks so it definitely need to make a bigger chunk of that. Bryanna Clark Grogan: Oh, yeah and it is happening. It is definitely happening. It is one thing that I just want to put out there for people when they are discussing it with other people who might be a little bit not convinced. I have a good friend here on the island. She is an animal rights activist. She always points out that vegan food is not exclusive; it’s inclusive because everyone can eat it. Caryn Hartglass: It’s for everyone and it’s good. Better than good. I think there is more variety when you are cooking vegan. Bryanna Clark Grogan: I think so. I know people, I am just always amazed that people will still say, “Oh, but what do you eat?” You think that they have gotten over it by now? Caryn Hartglass: I know. More people doing it yet the questions remain the same. Bryanna Clark Grogan: Exactly. The whole protein question, and blah, blah, blah. I mean, honestly, I have said this before, but there is no way in my lifetime that I can possibly try, not only the recipes that are out there now, but all the different combinations that I can think of. There is just not enough time. That is pretty amazing. Caryn Hartglass: I want to talk about chickpea flour for a minute. Bryanna Clark Grogan: Oh, okay. Caryn Hartglass: I notice that you use it in some of your crepes and satang. I am nuts over chickpea flour. Bryanna Clark Grogan: You are not nuts over it? Caryn Hartglass: No, I love it. Bryanna Clark Grogan: Oh, you love it. Caryn Hartglass: A lot! It is crazy the properties it has and what it is able to do. Bryanna Clark Grogan: I know. It’s a wonderful thing and I am still using it. I used to use soy flour a bit and now some people have problems with that. I was looking for a substitute and I started using chickpea flour and it works really well. I also love the taste of it. I don’t know if you ever tried the farinata recipe in Nona’s Italian Kitchen? Bryanna Clark Grogan: It’s a chickpea pancake recipe. It is an Italian peasant dish. It is all the rage in the restaurants now and it is just a flat, kind of – it’s chickpea flour that you soak and you put a little salt and garlic in it and you can put herbs in it. You can eat it as an appetizer. It has so many flavors. Bryanna Clark Grogan: …anything in it. Caryn Hartglass: Well, I kind of discovered chickpea flour – I am not a gluten, I don’t have – I think I have issues with wheat where it gives me an issue but I just started going and limiting my wheat and discovering all the flours just because it opens the door to so many different flavors and textures and things and I just got nuts with the chickpea flour. It’s just amazing; socca and putting in baking…. It’s just great and so good for you. Bryanna Clark Grogan: Farinata is the Italian version of socca. The Italians will tell you socca is the French version of Farinata. Bryanna Clark Grogan: It is from the same area in the Mediterranean. So, you know what I am talking about. I know it is a wonderful thing. What is easy to get an Indian grocery is called desan, d-e-s-a-n. They use it in a lot of their pancakes and things like that, too. I always have a big bag of it in the house. Caryn Hartglass: I always love the Indian groceries, too, because you can find lots of different beans and flours that you don’t see anywhere else. Bryanna Clark Grogan: Oh, yeah. We are lucky actually because in our area there is a large East Asian population and it is really easy to get, even in the smallest town that we shop in. In supermarkets you can get black lentils and all these kinds of dahl that you wouldn’t expect to find. Caryn Hartglass: You say you live on an island but there is access to different kind of food there. Bryanna Clark Grogan: Not on the island, although we have some farmers that grow vegetables in the summer. We are just a ten minute ferry ride from Vancouver Island and it’s a fifteen minute ride up to the nearest town which is about 30,000. Caryn Hartglass: Sounds pretty nice. Bryanna Clark Grogan: Yes it is. It is quite beautiful. It really is worth some of the inconvenience for the year. You just learn how to do big shoppings. Caryn Hartglass: But for people that don’t have access to lots of different foods, this is where the internet comes in. Bryanna Clark Grogan: Exactly and this is where I tried to use, put as many resources in the back of the book and make that for Canadians and Internationals as well as Americans which is more available in the United States. I don’t get a lot of stuff on line, but I do get some stuff online and I am really grateful for that. Caryn Hartglass: The thing is you can get dried beans anywhere and I think they are probably one of the best foods. They are inexpensive and you can do so many different things with them. There might be people that have allergies to beans. I know fava can be a problem. But, for the most part, beans can be pretty safe. Bryanna Clark Grogan: Yes, they are and they can last for pretty long time if you store them properly. I always feel safe if we have beans and rice in the house, which we always do. You can live on beans and rice – you can try a new recipe from a every country every day with beans and rice or beans and another grain if you want to change it. I thought of writing a book on that actually. Caryn Hartglass: Well, one of the things that I like is you know what you are talking about, that you have been there and done it many, many, many times. You can read that in here, which is helpful. I also like the tone, especially when you talk about preparing beans and you talk about the way people do it. But, the bottom line is, just do it the way you want. Bryanna Clark Grogan: Yeah, exactly. I just wanted people to know that some of the rules that we hear about aren’t really true and so why should that limit us? So, whatever way is convenient for you or you think works out better for you then there is not really a wrong way. There are just different ways. Caryn Hartglass: There is also a great discussion in here about egg substitutes and I think that it is probably the best that I have seen in terms of egg substitute discussions. You really break down what we use eggs for, the different properties, and then how substitutes can fill a particular need. Bryanna Clark Grogan: Yeah, I think that’s important because I have had quite a few failures in my young days as we all have, I am sure. Caryn Hartglass: You do fine and sometimes it leads to something new. Bryanna Clark Grogan: Exactly, it’s a learning experience. When I thought about it, I thought eggs do so many different things so one egg substitute is probably not going to do the trick all the time. I thought it might be helpful for other people. I also want this to inspire people to do their own recipes. So, the more knowledge you have, the better you would be at that. Caryn Hartglass: I like using ground flax seeds a lot in water because, number one, flax seeds are so good for us, and you get that gooey consistency. But, I never strained them. I read in your list of egg substitutes that you can strain the seeds out. Bryanna Clark Grogan: You can but I don’t usually do that and when I want a really light color, I use the golden flax seeds and then it doesn’t make the things brown. I think if you are straining it, you are probably getting some of the fiber out of there and I like to leave as much fiber as I can in there. Caryn Hartglass: I am kind of a believer that the food should be good for you, nutritious, and taste good and look good. For a long time, a lot of cuisine didn’t consider the health so a lot of the chefs would peel things and strain things and leave out all the stuff that is good. Bryanna Clark Grogan: Exactly. Like the tomatoes – I think I mentioned that somewhere about not taking the seeds out of the tomatoes. They found actually now that the seeds and the gel around the seeds contain a lot of the flavor of the tomatoes so why should we get rid of them? Maybe it is laziness but I never did that. Caryn Hartglass: I know, they are good for you and I think we need to change the attitude about leaving the healthy parts of food in the recipes. Anyway, it has been great talking to you. Bryanna Clark Grogan: Well, thank you very much and I hope you have a wonderful holiday. Caryn Hartglass: Well, yes, you too and I know I will be digging into this book and making some really fun things so thank you. Bryanna Clark Grogan: Well, thanks a lot. Take care. Caryn Hartglass: That was Bryanna Clark Grogan and check out her website, very informative, lots of great things, at BryannaClarkGrogan.com. I am Caryn Hartglass and you have been listening to It’s All About Food. Have a delicious week.